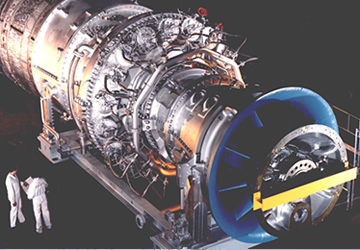 The supply, inspection and testing of flexible hose assemblies for gas turbines in the power generation industry is a major speciality at Buckley Industrial. We have close to 20 years experience in the industry and have evolved our systems to mirror exactly the manufacturing, inspection and testing standards required. Our test rigs are highly accurate and can be set to the exact test pressure required for any particular assembly. Over pressurising an assembly can harm its integrity so accuracy is of the essence. We have developed practices whereby we work with the technical management at the power station from the beginning of an outage, providing protective covers and identification labels for sets of hose assemblies as they are removed from the engine. We will also provide a collection service if required and will ensure that the work is complete, fully meets industry standards and is returned in good time so that start up after the outage is not delayed. If required, replacements for any failed assemblies can be supplied and we pride ourselves on providing a very quick turnaround service to avoid any delays to start up. All assemblies returned to the customer will have been externally inspected, visually pressure tested to industry standards and thoroughly dried, inspected internally using a videoscope then capped and securely packaged to avoid any subsequent internal or external damage. Each assembly will be tagged with all relevant identification details including its location to aid the re-fitting process. Test certificates are prepared for all assemblies which test successfully and material certificates are provided, where required, for new and replacement manufactured product. This service has its origins in the UK but has now been extended to cover many European locations including, Ireland, Benelux, France, Spain, Italy, Hungary and Scandinavia. We have also developed a Mobile Test Unit which can mirror the services described above and can be deployed at any location should sufficient testing demand be identified. Contact us to discuss your requirements. We would be happy to work with you to tailor a package which precisely meets your needs.